Mothers Day is an excuse for most people to take Mom out to brunch. But ours is not a brunch family. Hell, on weekends, you'd be hard pressed to see my parents showered before 3 o'clock in the afternoon. So I did the next best thing. I took the Rents out for dinner. 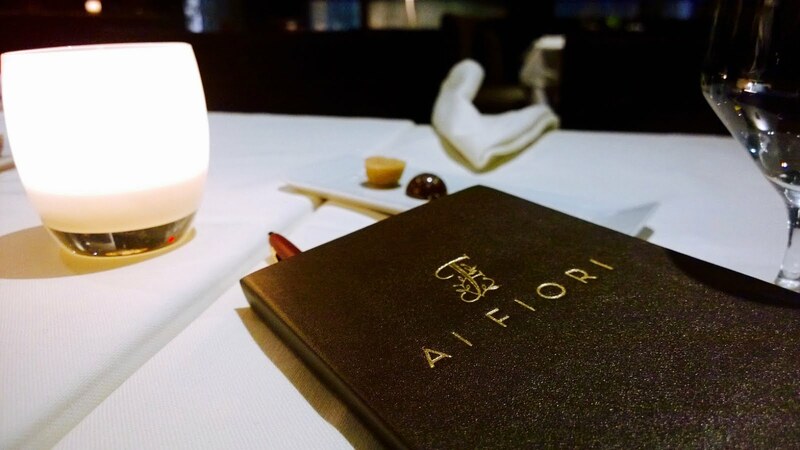 Ai Fiori, the Michelin starred Italian from Michael White, has been on my list for a while and now was the time to dust off the ol' wallet and head to what I think should be renamed The Hotel District, midtown, north of Herald Square. I was slightly surprised that on a weekend night the place wasn't more crowded and the hosts were willing to seat me almost immediately upon arriving even though I was alone and early. 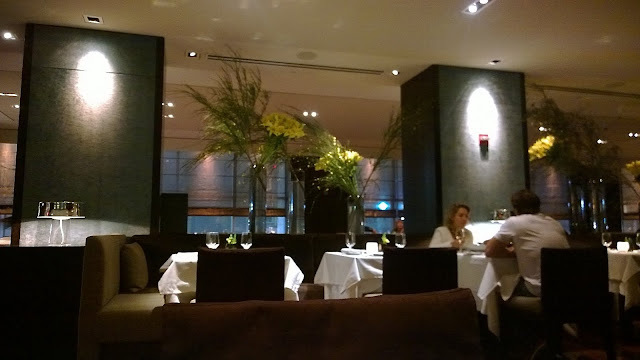 As an aside, the staff was exceedingly nice. No pretension whatsoever. 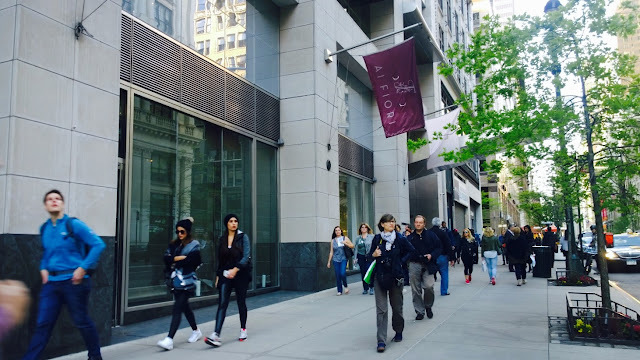 Those of you who recall my unfortunate tiff with the staff at Beautique know that politeness and high end restaurants don't always go hand in hand. Shrink, aka Mom, ordered the Vellutata as her first course of the night. It's a lobster soup with truffle and tarragon. 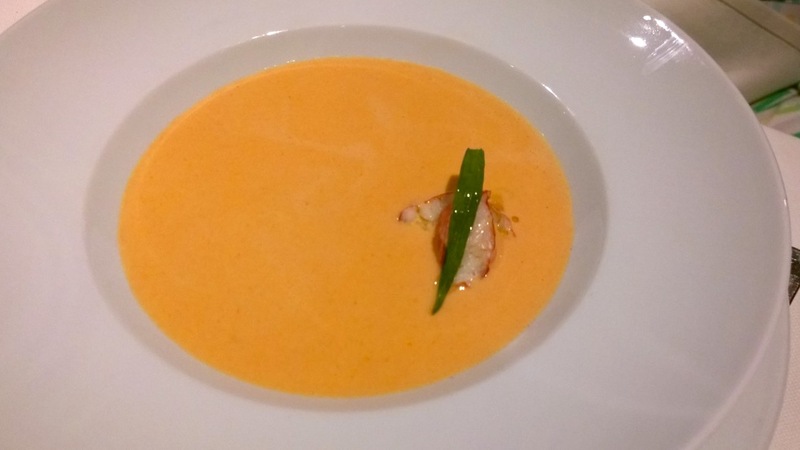 You won't be disappointed, but this isn't your standard lobster bisque. It's more herbal. 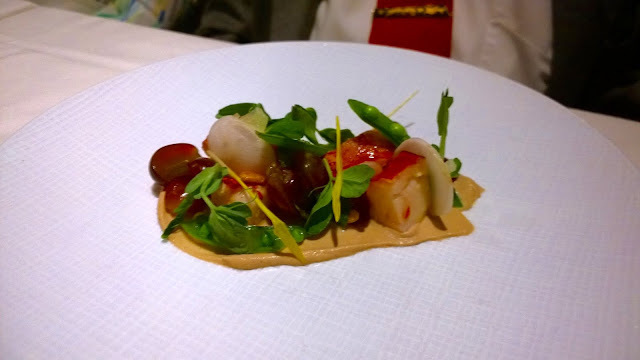 Dudeman's appetizer was the Insalata di Astice, a Nova Scotia lobster salad with turnips, pea tendrils, grapes, and pine nuts which he liked quite a bit, although he wished it was somewhat larger. 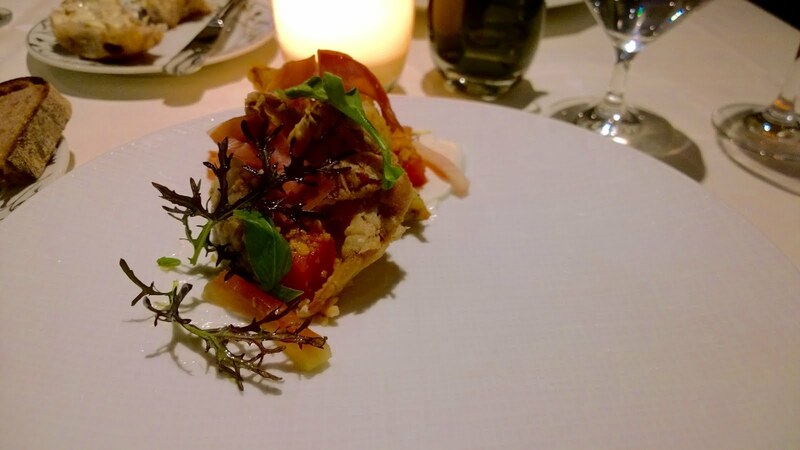 I, in keeping with the crustacean theme, ordered the Moleche, a soft shelled crab with watermelon, lemon yogurt, prosciutto, and pine nuts. I won. I remember loathing soft shelled crab, but in the last few years, if I order it at expensive restaurants, it always tastes great. Who'da thunk? This version was soft, yet crispy and warm, but with the watermelon very light and seasonally appropriate. 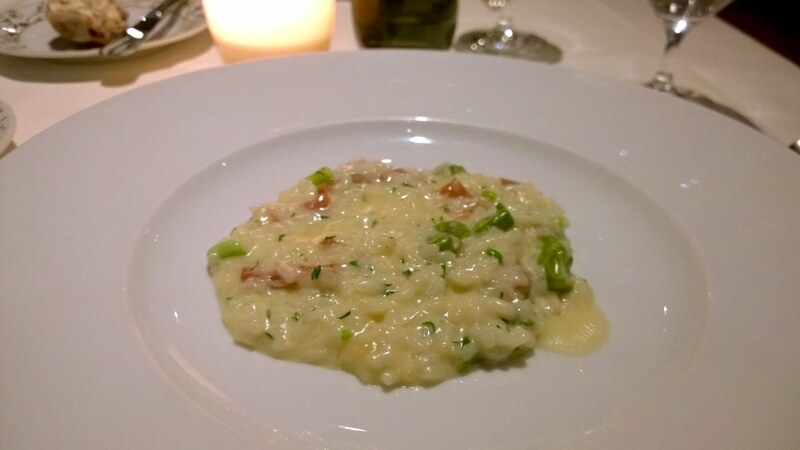 The second course, which Dudeman skipped and shared with Shrink, was the pasta/rice course. The carb load course. I ordered the Risotto, riso aquarello, spring vegetables, prosciutto, and tallegio which was fantastic. Smooth, cheesy, and perfect. Unlike most of the dishes, it wasn't plated to look like much more than a lump of barf. But don't let that fool you. 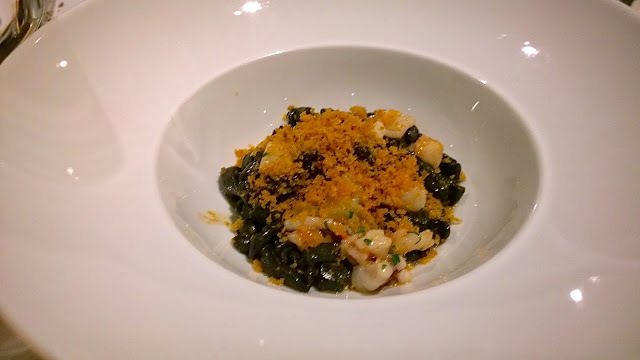 The pasta course which Dudeman and Shrink shared was the Trophie Nero, a black pasta with a ligurian crustacean ragu, seppia, scallops, and spiced mollica. They loved it. Shrink called it "the best dish of the evening," though I wasn't nearly as impressed. While they found every flavor swoon-worthy, I found it slightly dull. As an aside, if you get the pasta as a main course, the portion size doubles. 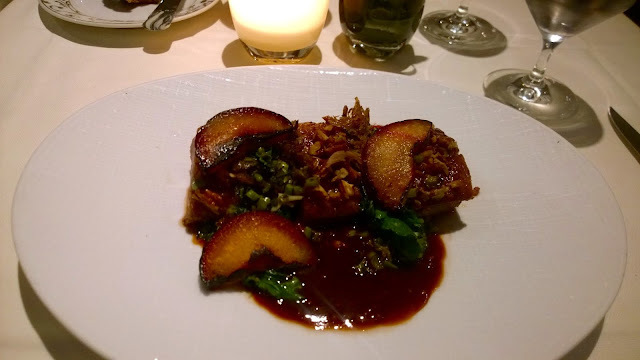 Shrink's main course was the Faraona, a guinea hen dish with porcini mushrooms and cipollini. 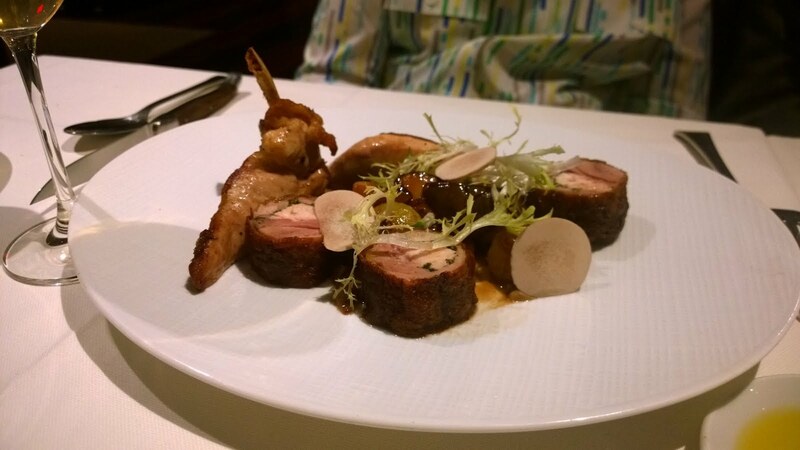 The guinea hen is served two ways. Part of it is served more traditionally, seared in whole pieces. Another part is served in a way that reminded me of a sushi roll, except that this roll was made out of a combination of dark meat, white meat, and herbs. In theory, I'd love this novelty, but in practice it was unfortunately dry and somewhat bitter. Meanwhile the whole pieces of the hen her incredible. Dudeman ordered the Spada, swordfish poached in olive oil and served with artichoke, prosciutto, and a basil pesto. This was the weakest of the entrees. Other than looking good on the plate, nothing really stood out. The fish itself didn't have any flavors that seemed particularly unique to this recipe and the ornamental side dish was no different. 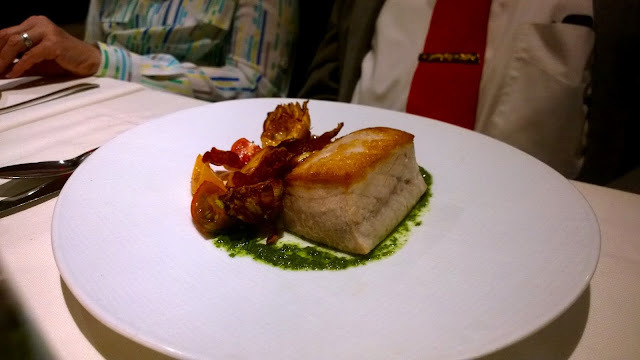 Far from tasting bad or even less than good, I've made swordfish steak at home that's tasted pretty similar and the whole point of going to a restaurant of Ai Fiori's caliber is to get something I can't get elsewhere, let alone twenty feet from where I'm sitting right now. On the exact opposite side of the spectrum, I'm happy to state that the best entree that was ordered was mine, the Anatra. Long Island duck, broccoli rabe, kohlrabi (a kind of cabbage. I had to look that up, too), pecans, and plums. Every flavor exploded without a thought to mildness. Tart fruit, crisp duck fat, mellow nuts. They all worked in perfect concert with each other. I cannot recommend this enough and neither could one of our waiters. Shrink and Dudeman's shared dessert was the Budino. Chocolate mousse served in a chocolate tube with a little bit of cake and a small scoop of gelato, this was delicious. This creamy dessert was perfection. Heavy, but not too big. 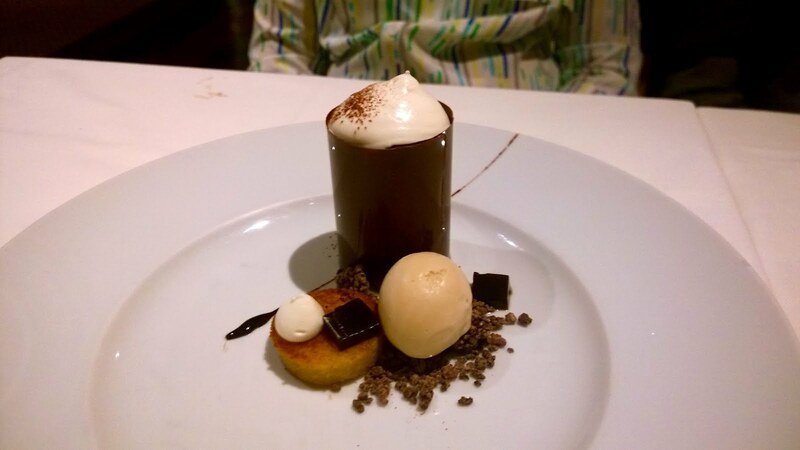 Decadent, but not over the top the way a twenty layer chocolate cake would be. 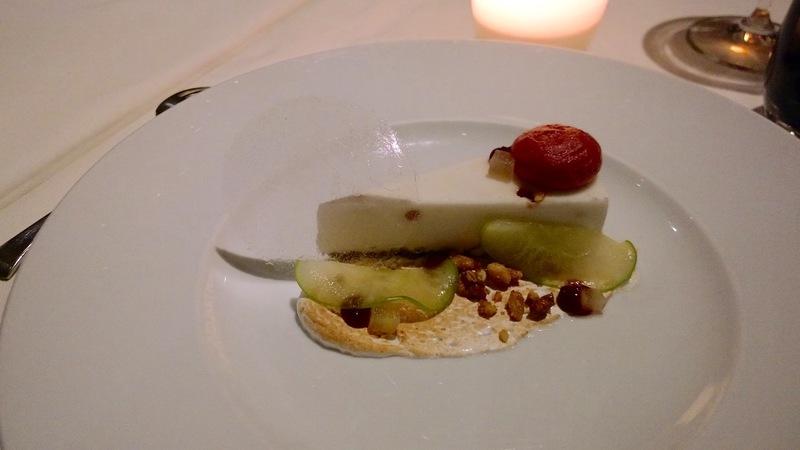 My dessert was the Créme Glacée, a sort of sorbet cake served with pine nuts, razor thin apple slices, and a scoop of . It was ice cold, very sweet, and pleasantly light. If you tend to be one of those folks who eschew desserts that are heavy and rich, then this would be what I would recommend. I didn't love it. It didn't blow me away. But it was nice. 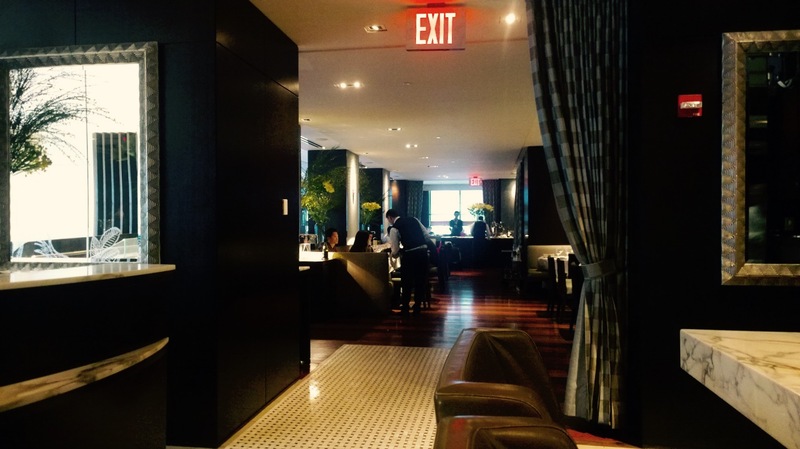 The four course prix fix cost is about $100 per person. 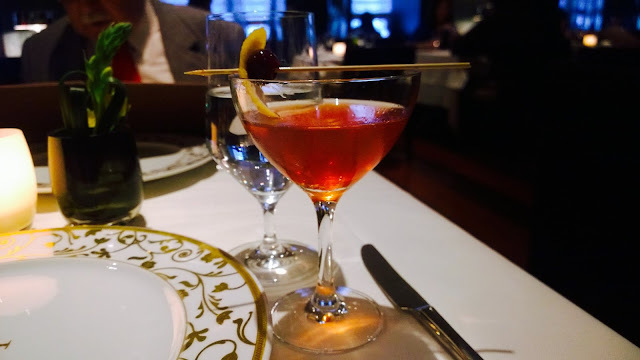 Cocktails clock in at $16. Wines by the glass range from $12 to $50. The grand feast you see here came to a bit over $400 with tax and tip.